Eleanor Roosevelt said, “Do one thing everyday that scares you.” Today that challenge came courtesy of Scribble Shop on line craft shop. No, they didn’t challenge me to DIY with a chain saw, or fire, or anything mildly explosive. Scribble Shop asked if I wanted to participate in an Iron Chef type of craft challenge. Except I didn’t have to go to Japan or compete against Masaharu Morimoto. Double pity. The original Iron Chef is tops in this house! ScribbleShop sent me and a group of bloggers a mystery box of supplies from their shop. They challenged me to use everything in the box to make one craft project. Bitzkrieg helped me open the box. For those of you who didn’t watch the video (don’t tell Blitzkrieg. He’ll be so disappointed. You know how he loves the camera) here’s a photo of the stuff from my mystery box. 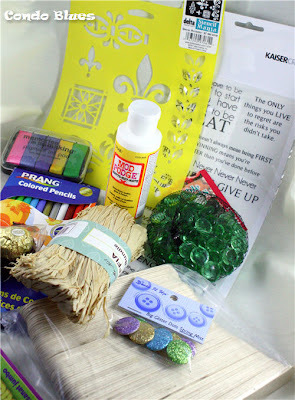 ScribbleShop sent me a Metallic Stamp Pad , Dress It Up Embellishments, Mod Podge, Stencil, Raffia , Glass Gems, Motivational Quotes, Popsicle Sticks, Colored Pencils, and Ferrero Rocher Chocolates. I opened the box. I got scared. Everything ScribbleShop sent is nontoxic (thank you ScribbleShop!) That is not the reason I was scared. I looked at this pile of stuff and had no idea what to do with it all. Popsicle sticks?! That’s for little kid crafts. This is out of my comfort zone. It looked like my best bet was to create a doodad that served no practical purpose or was a clever reuse of a major piece of recycled material. Oh man oh man I wished I got the box with the fabric swatches and feathers! I’ve been sewing since I was 5 years old. With fabric, at least I could make a hat. Wow, who do I sound like? Yep, all of those Design Star contestants that drive me batty saying that they don't do x, y, or z style. And that’s EXACTLY why I decided to so this challenge. To force myself to do something I normally wouldn’t. Then it dawned on me. Popsicle sticks are wood. I should treat them like a woodworking project. Blamo! Back into my comfort zone. 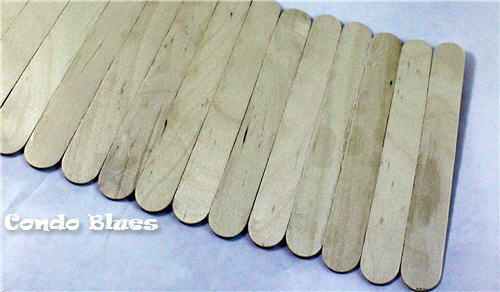 I’ll glue the Popsicle sticks into mini wood pallets and make a butterfly. 1. I made two small pallets by gluing 14 Popsicle sticks together for each pallet. I let them dry overnight. You can use wood glue too. I didn't because I wanted to try a new all purpose glue I recently bought. 2. I drew a wing on each pallet with pencil. 3. I cut the wing from the pallet using my Dremel and a cutting bit. I used a sanding bit to smooth the edges. 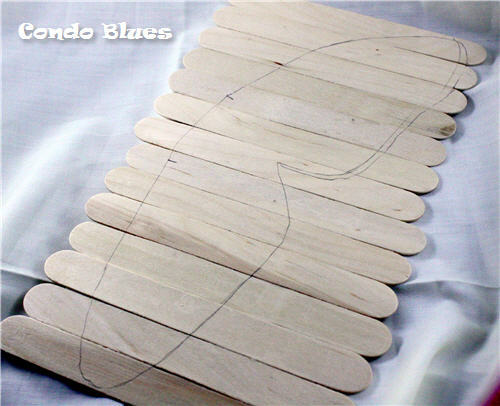 If you do not have a Dremel, you can use a fine jigsaw blade or a coping saw to cut the wings. 4. I used the same technique to cut and smooth the butterfly’s body from a single Popsicle stick. 5. I primed both sides of the wings with white spray primer and let it dry. 6. 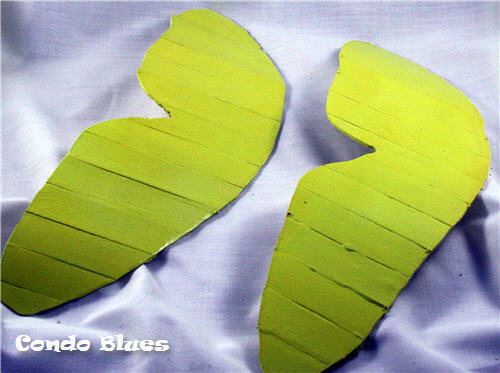 I painted both sides of the wings yellow with the yellow spray paint and let it dry over night. At this point I wasn't sure if I was going to decorate both sides of the wings or not. I later decided against it. 7. I broke out my mini sledge hammer to embellish the wings. You don’t craft with a sledgehammer? 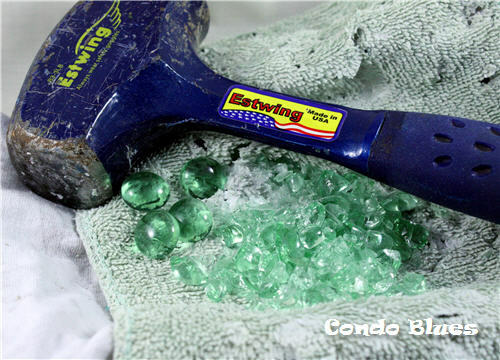 I wrapped the glass marbles in an old towel and smashed them to bits with the sledgehammer. I'm going to win this challenge one way or another. I Mod Podged packing tissue paper around the edges of the wings. I created the swirly shapes using the colored pencils and stencil on the cardboard box. 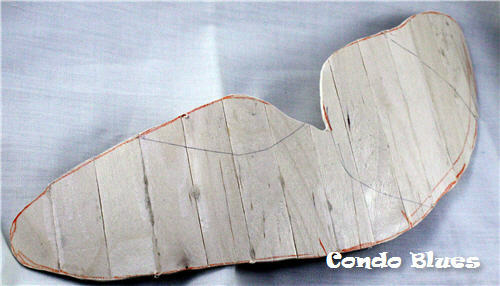 I cut the shapes from the top layer of the cardboard box and Mod Podged the shapes onto each wing. I glued the glitter buttons to the top of each wing. I cut small rice krispie shapes from the packing peanuts, rolled them onto the stamp pad to color them, and glued them onto the center of each wing. 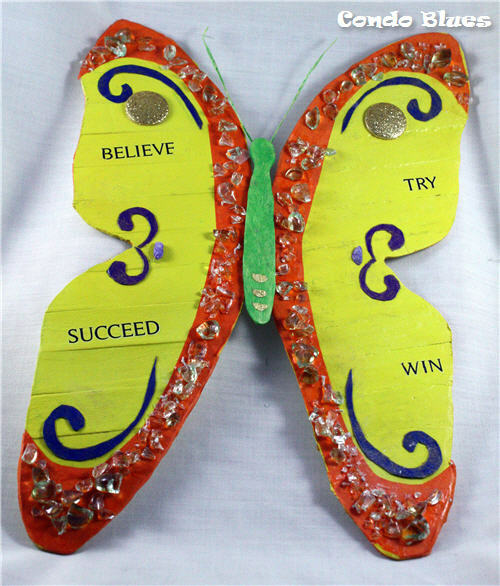 I applied four motivational type words to the wings using the transfer letters. I glued the smashed marbles to the edges of the wings. I stained both sides of the body with green ink from the stamp pad. I used a standard hole punch to punch circles from the Ferrero Rocher Chocolate foil wrapper – not an easy task by the way. I cut the circles in half and Mod Podged them onto the body. I rolled a length of raffia onto the stamp pad to color it, split it lengthwise, folded it in half and glued it to the back of the butterfly’s head. 10. I glued the wings to the underside of the body. A mini pallet butterfly was born! ScribbleShop gave me a little thank you gift for taking part in the SribbleShop Challenge. I want to share it with you. Mother’s and Father’s Day is coming up, buy those supplies now and use the discount code CONDOBLU to receive 15% off your order. This code is valid from March 1, 2012 until April 30, 2012. I poked around ScribbleShop and they have many items that aren’t easy to find around here and a few that are new to me. For example, ScribbleShop sells Delta Soy Craft Paint, which I've never heard of until now and am very interested in trying a soy based craft paint. Have you used it? Did it work well? What did you think? I guess I should follow ScribbleShop’s suggestion and contact ScribbleShop via Facebook, Twitter, or Google+ and ask them about the soy paint, huh? Disclosure: I received product and a stipend to purchase materials and for my time to design the project for this post from ScribbleShop and Blueprint Social. However, my ideas, words, and opinions are my own and are not influenced by this compensation or the candy they tucked into my mystery box. Smashing the marbles was the best part of the project. "Just when the DIY diva thought it was over she made a Butterfly!!" So cool! I enjoyed the bit about the marble smashing as well. I must have this mini sledgehammer you speak of. All this time I've been smashing pottery with a regular old hammer...and the marble smashing is genius. I have buckets of those marbles and to think I've been paying too much for mosaic glass when all I needed was a sledgehammer. Your project is "Smashing" indeed! This is so totally fun and original! I love that you sawed and smashed things. You are brilliant! Demo is my favorite part of DIY! Brilliant realization that popsicle sticks are just tiny pieces of wood! :) Love the smashing photos! It's lovely!!! :) The smashed marbles was a great way to use everything! This mini wood pallet butterfly is so creative. I like how you used the popsicle sticks to make the wings, and how you smashed the gems to use it for embellishment. At first when i saw your craft i was like "hey we didn't give her that" and then I continued reading and saw that you took a sledgehammer to them!! haha good job! http://www.facebook.com/ScribbleShop tomorrow, March 30th, 2012.